Wisconsin DNR Fisheries actively manages stream habitat in Brule River watershed, and the Club has assisted fisheries personnel with many of the projects. Habitat management in the watershed has focused primarily on restoration of spawning areas, particularly above County Highway B. DNR crews, funded with trout stamp money, along with volunteer help from the Club have hauled in nearly 1,500 tons of washed, uncrushed gravel to artificially rebuild spawning beds at more than 50 locations on the upper Brule. Further, small woody debris, much of it tag alder, had fallen into many upriver feeder streams over the last century. Also, many areas upstream of beaver dams had filled in. This fallen debris and the beaver dams collected sand moving downstream naturally and buried the stream channel to depths of 1 or 2 feet, which made the streams wider and shallower. This in turn, slowed the water and limited the water's ability to flush through the sandy sediment. DNR trout habitat crews have removed dams and debris, cut and pulled out alder on portions of 12 high-quality streams that flow into the Brule. As water started flowing faster and the stream naturally cut deeper channels, the original gravel stream bed has been exposed, and large logs that could provide cover have been uncovered. This type of work has restored 6.3 miles of these Brule river tributaries. Managers also have experimentally installed large logs in different patterns to provide overhead cover and channel water so that it would scour sand and soft bottom mud, exposing streambed gravel. These restored waters are monitored annually for spawning activity and hatching success. As habitat needs have been address in the upper parts of the watershed, work on tributaries north of Highway B has been initiated in recent years, and the Club has helped selectively remove small woody debris from portions of two of these streams. Beaver control is another essential tactic used to maintain quality trout habitat. The United States Department of Agriculture is contracted with Trout Stamp dollars to remove problem beaver and their dams on about 35 stream miles in the Brule River watershed. Each fall Department biologists and Federal trappers walk and/or canoe the entire stretch to find and remove problem beaver that would either block trout from reaching upstream spawning areas or, if not removed, eventually destroy trout habitat. The Club and the Department have also combined efforts to remove problem culverts that also block spawning runs. 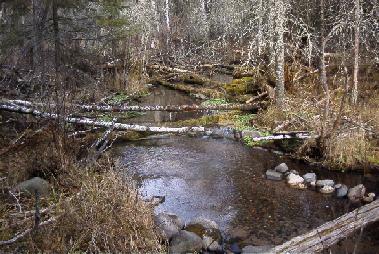 A more detailed description of the management of the south-shore streams between Superior and Ashland was published in the Wisconsin Natural Resources Magazine in 2005. Click to see Little Streams Feed a Big Fishery. To view short videos of a couple of habitat projects, click on West Fork, Spring Lake, and Stones Bridge. Restored in-stream habitat on a tributary near Stones Bridge. Photo courtesy of Wisconsin Department of Natural Resources. Click on Habitat Project Table to see project maps, descriptions, and photos of many of the joint Brule River Sportsmen's Club - Wisconsin DNR Fisheries and Wisconsin DNR Fisheries projects.